Marc McCallister joined McCallister Law Group in January of 2015 as a Partner. He concentrates his legal practice in plaintiff’s personal injury law. His areas of expertise are medical malpractice, nursing home abuse, products liability, premises liability, motor vehicle and wrongful death cases. Mr. McCallister has practiced law for ten years in the City of Chicago. Previously he worked as a defense attorney at a large insurance defense firm where he defended area hospitals and physicians. In the seven years prior to joining McCallister Law Group, Mr. McCallister worked at another plaintiff’s law firm as an associate. In the past five years, Mr. McCallister has worked tirelessly to represent individuals who have been injured. Mr. McCallister has distinguished himself as one of Chicago’s up and coming elite trial attorneys by taking many cases to trial. Mr. McCallister has been identified as a “Rising Star” by Super Lawyers in 2012, 2013, 2014 and 2015. This award is only handed out to 2.5 percent of all young lawyers under the age of 40 through the state of Illinois. Mr. McCallister received his undergraduate degree in advertising and public relations from Pennsylvania State University in 2001. He attended Chicago-Kent College of Law for his law degree, which he completed in 2005. While attending Chicago-Kent, Mr. McCallister was an active member of the Student Bar Association where he served as Vice-President. 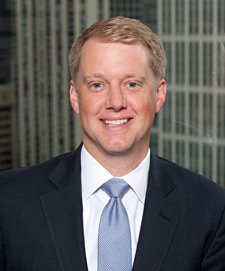 In addition to his legal practice, Mr. McCallister is an active member of local bar associations. Currently, his is a member of the Illinois Trial Lawyers Board of Managers. He is also member of the Illinois State Bar Association and the Chicago Bar Association. Away from work, Mr. McCallister is passionate about education and serves as the Secretary on the Board of Directors for Tutoring Chicago. Tutoring Chicago is a non-for-profit tutoring program that provides free one-on-one tutoring to grade school students on the near North and Northwest side of Chicago. Mr. McCallister has been a member of Tutoring Chicago’s Board of Directors for five years, a time in which the organization has undergone a rebranding and experienced exciting growth.